This post is part 2 of 2 of how I migrated the CIPS Vancouver Security SIG Links Directory page from LinksDB to CCK/Views. In part 1, Migrating LinksDB Module Data to CCK, I covered migrating LinksDB data into Drupal nodes and taxonomy. In this post I cover creating the URL Links directory page in Views. Even if you're not interested in LinksDB, this post provides an example of theming Views to display a hierarchical list using taxonomy to define the hierarchy. This same technique was used to render my Drupal Notes page. The View definition is un-extraordinary. Here is a snapshot of its edit page, an export of it is included at end of this article. 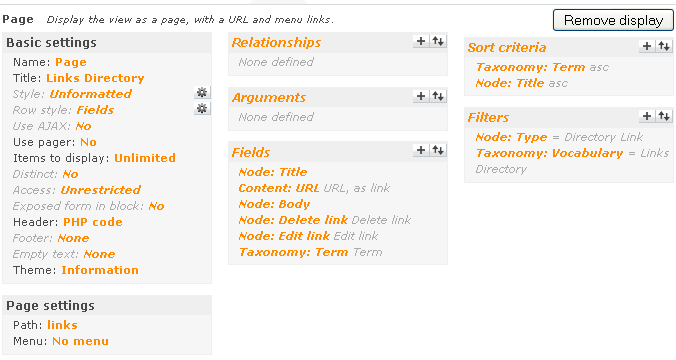 As you would expect, the View is set to filter on Node Type = Directory Link, and the Links Directory vocabulary. The only required field is Taxonomy: Term. The other fields are those to be displayed. Although the hierarchical theming will change the grouping, Sort criteria is still important. In this case we're sorting on Taxonomy Term, then Node: Title. Be sure to select the "Display even if view has no result" checkbox. The code for these theme files is shown below, and they are both available as file downloads. If you use these files, you'll need to rename the extensions back to ".tpl.php". In addition to providing an array of formatted entries named $rows, Views also makes the "raw" node data available in an array named $views->result. The "raw" information array contains the actual Drupal node data. Most importantly in this instance, it contains the term id (tid) associated with each node. Taxonomy term data in the $views->result array is used to create a list of nodes, $nodes_by_tid, indexed by taxonomy term. $nodes_by_tid replaces $rows. A lookup table of parent/child taxonomy terms, $subcategories, is also created. With it, a list of child terms can be found for any given parent. Creates appropriate title headings and adds HTML for collapsible field sets. // Create a node list indexed by taxonomy term id. The row style output template file renders the individual URL entries. Even though we've altered the way the row entries are listed, each row entry (URL entry) is still rendered in the standard way through this theme file. * - $field->content: The output of the field. * - $field->raw: The raw data for the field, if it exists. This is NOT output safe. * - $field->class: The safe class id to use. * var_export to dump this object, as it can't handle the recursion. * - $field->inline: Whether or not the field should be inline. * - $field->inline_html: either div or span based on the above flag. * - $field->separator: an optional separator that may appear before a field. The LinksDB module placed all of the management functions on the directory page. There was not a separate content management page. To reproduce this, the Views Edit and Delete node fields are added to the list of fields output for each entry. Views logic is smart enough to display them only if the user has access to use them. As previously mentioned, a conditional link named "Add Directory Link" is placed in the header for node creation. You should put your functions in your template.php, not the tpl.php file because the template can't be loaded multiple times if it defines functions. This can cause your site to crash if you put a view that uses this style on the page twice for some reason. Second, this is complex and interesting enough that it should probably be a style plugin all its own. That way you get settings. And stuff. I've agonized about whether to put the function in the template.php file or the style output theme file. The first instance (for the "Drupal" page on this site) has the function in template.php. For this instance I put it in the theme file. I've argued myself back and forth. Since the function replaces the "foreach($rows as $row)" construct and is only called from this theme file it seemed appropriate to place it in the theme file. I didn't worry about a function name collision because this theme file is only called once. If you're telling me a name collision is possible even in this situation, that would, of course, clinch the template.php location! I'm currently digging into plugins and handlers. Enlightenment isn't coming as easily as I'd hoped. Thanks for sharing. Something I was looking for a long time. Now time for me to tryout on a nested taxonomy deeper than you have. Help with the last step? Hi! This is EXACTLY what I was looking for and I'm just at the last stage of trying to style the view. I'm not sure where the 2 tpl files should go. I've tried them in the views/theme folder as well as my theme folders and no joy. Can you please tell me what I am missing? Thank you so much for writing this up. An excellent and informative blog posting on adding a hierarchical views listing grouped by terms. Figured it out - move the function into template.php to avoid the 'cannot redeclare' error. Has anyone modified this for tables instead of unformatted? Anyone happen to have customized the table style? I'd love to do something like this with tables but I'm new to drupal and no php wiz, so kind of struggling through it on my own. I'd also love to see this grow into a style plugin. I wanted to chime in regarding function name collisions. I wrap the function in a function_exist call.